In my former life, some friends of mine had a big chili cookoff at their house every year in which they pitted their friends' culinary skills against one another. So, this year I decided to steal their idea...and see just how talented my foodie friends are. 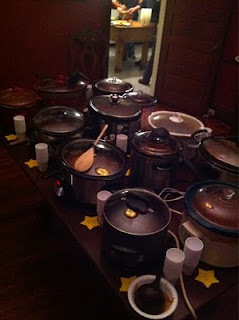 I invited people to bring their best chili recipe in a crock pot. I set all the pots on the dining room table (connected with extension cords & power strips). Each pot was numbered & given a stack of corresponding numbered tasting cups. After everyone tasted the chilies, they were given 3 beans with which to vote for their favorite dish(es) by putting beans in numbered cups set up along the fireplace mantle. 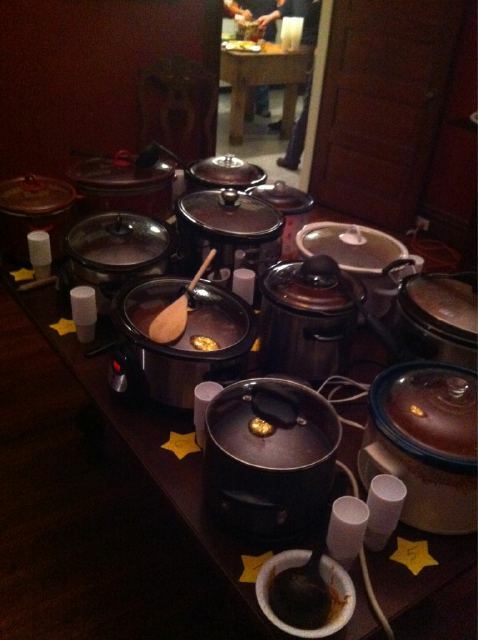 There was one rule for the night: No white chili. This wasn't a best chicken-and-bean soup cookoff. My friends came through and produced some really good food. All 13 of the chilies earned votes. There was many different variations, of course. Some used beef; others used pork. I think Ashby tried to sway my vote by adding bacon to his. One featured corn; another featured hominy. A few were very spicy (Simon!). Overall, they were all good!